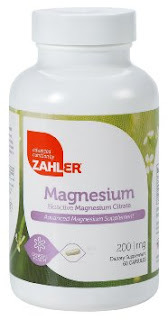 I recently received Zahler's Magnesium Citrate to try out, so as I always do I did a little research. I had no idea Magnesium Citrate did so many important things in my body! It is responsible for over 300 metabolic reactions in the body. It helps maintain normal muscle and nerve function, keeps your heart rhythm steady and bones strong. It's highly absorbable and helps regulate blood sugar and blood pressure levels. This is going to be added to my daily supplement regime. Just take 1 capsule twice a day with meals.